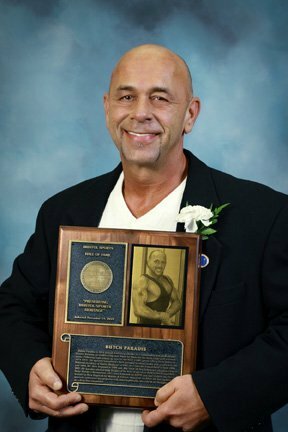 Butch Paradis, a 1974 Bristol Eastern graduate, is a conditioning and professional trainer focusing on conditioning and rehab for those on the local, state and national scene. Following high school, he was on the first USMC power lifting team between 1974-1976. He opened Connecticut’s first personal training center and graduated the National Academy of Sports Medicine in 1991. He’s won Mr. Connecticut in both 1994 and 1999, Mr. New England in 1994 and the Over 50 North Atlantic championship in 2007. He was also selected Body Builder of the Year, at age 53, in 2009 by the Competitive Body Builders Association. He’s been featured on ESPN and was ranked the No. 1 trainer in New England by Muscle & Fitness magazine in 2003. He has spoken at seminars and career day programs and, most importantly, has won all his championships as a drug free competitor. To cap off his career, Butch was chosen the 2011 Mr. America over 50.